The other day I asked Anita if there was anything special she wanted for dinner this week. She said cabbage rolls. I instantly thought smoked cabbage rolls. So that’s what I made, and they came out fantastic. Tender, moist, flavorful stuffing, wrapped in steamed cabbage leaves, all in a simple tomato sauce. Smoked for about an hour, these cabbage rolls combine the traditional with just a hint of smoky flavor. We both agree, these are fantastic. You can also make these awesome cabbage rolls in the oven, baking them at 350 F. Smoking them does give them a different, unique, wonderful flavor, but they are still great in the oven. Fire up your smoker for high heat (350 F) cooking. Use whatever wood you prefer. You can also cook the rolls in the oven at 350 F.
Add the cabbage with the hole where the core was facing down. Cover and boil for 10 minutes. Remove the head from the water and let cool slightly. Gently remove 10 large leaves. You might need more or less depending on how large they are. Lay the leaves flat so that the stem side is up. Using a sharp knife, gently cut the stem section horizontally, removing as much of the stem as you can without cutting the leaves. Combine remaining roll ingredients in a large bowl. Mix well. Working in batches, form meat into a miniature log that is about 1" or so in diameter, and about 2" long. Place each log onto a leaf near the stem. Fold in the sides then roll up from the bottom (stem area), like you would a burrito. Place into a disposable aluminum pan, seam-side down. Pour sauce over the rolls. Place onto smoker and smoke for 15-20 minutes. Cover pan tightly in foil and continue smoking for up to 45 minutes or until the internal temperature of the rolls reaches 160 F.
Let cool slightly then serve. 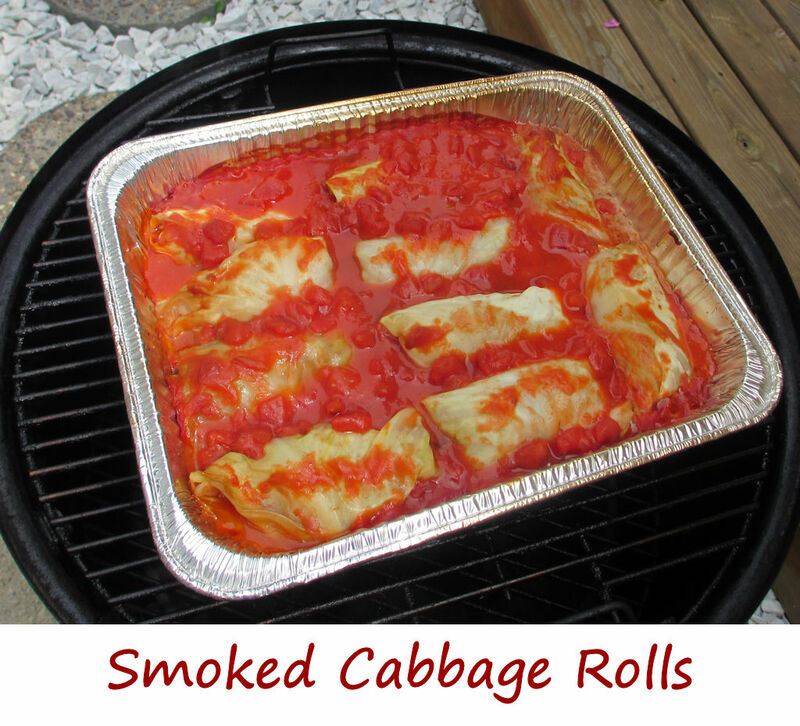 This entry was posted in From the Grill & Smoker, Main Dishes and tagged cabbage, cajun, recipe, rolls, smoked, Smoked Cabbage Rolls by Mike. Bookmark the permalink.